Join us at ANIME EXPO, an annual convention dedicated to Japanese culture in Los Angeles, California! Kindly note the schedule listed above are exhibition hours. Anime Expo 2016 convention opens 24 hours, featuring arrays of late-night events! We’ll be at the Anime Expo again this year, and we have prepared arrays of fun activities for just for you! Join our workshops and activities in our booth, and you may receive Bushiroad freebies afterwards. 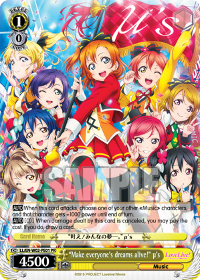 Exciting events for all Bushiroad card games available! On top of that, if you shop at our booth, you may get your hands on additional exclusive goodies! Participants may get special gifts upon completion of each game. Visit our booth to find out more! Love Live! Sunshine!! Meet & Greet Session at Anime Expo in the US! *No photography, filming, voice recording, any form of body contact, handshakes, autographing or direct gifting. *Schedules and details shall be given to each customer at the venue. Don’t forget to put on your running shoes too, as the Bushiroad Stamp Rally is back again this year! We’ll also be joining the Industry Panel to answer all of your burning questions! Visit our booth for more details! More exciting activities available! See you at booth #2601!